City tour of Cochin including Santa Cruz Basilica. Sightseeing in Munnar including Eravikulam National Park, Tea Museum. Boat Ride on the Periyar Lake, Thekkady. Appreciate love with our exclusive honeymoon package covering Kerala. Honeymoon is the beginning of the wonderful life you are about to embark. Visittnt has explored several destinations and has given you a complete romantic everlasting experience with Cochin, Munnar, Thekkady, Kumarakom and Alleppey. This package provides a sublime experience with Kerala wildlife attraction, hill station, beach, water sports and others. We help to get you know each other better and embrace the presence of each other with our six nights and seven days package. On arrival at the Cochin our friendly Representative will be waiting for you at the Airport who will take you to the hotel. Cochin is situated on the south-west coast of Indian Peninsula. It is known as the queen of the Arabian Sea and the Gateway to Kerala. In the afternoon move out for the local tour. 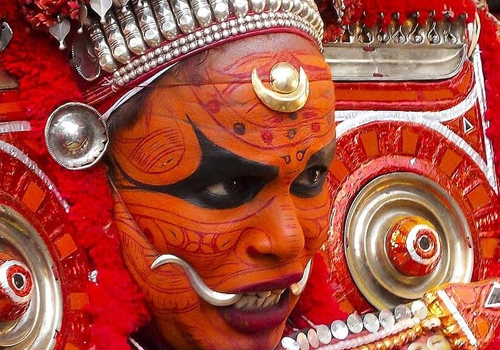 We take you to witness one of the most colorful and exquisite performing arts in the world – Kathakali. After two hours of glorious entertainment, remember to get photographed with the Kathakali performer. In the morning after leisurely breakfast drive towards Munnar - It is one of the famous hill stations in Kerala. It was once the favored summer resort of the erstwhile British rulers. Tea Museum, the Eravikulam National park home of the endangered Niligiri Thar (Ibex), pristine valleys and mountains- exotic species of flora and fauna in its wild sanctuaries and forests - aroma of spice scented cool air welcomes the tourist. On reaching Munnar check in hotel and relax for the rest of the day at the hotel. Munnar is the favorite hill station and the most popular tourist destinations in south India. Lush green landscapes, serene lakes, thick forests, spice gardens, tea estates are the evident features of Munnar. It is also the ideal location for paragliding.Visit Devikulam, Mettupatti Dam and Farm, Nyayamakad, Echo Point, Rajamala, Kundala,T Power House Waterfalls, Malankara Reservoir and so on. Late in the evening return back to the hotel for an overnight stay. After morning breakfast enjoys the drive to Thekkady – It is one of the most mesmerizing natural wildlife sanctuaries. The only place in the world to enjoy the sight of the herd of Elephants and other animals quenching their thirst and getting engaged in other playful activities in their most natural form. One can experience the most enchanting holiday in the crisp, cool air of the Western Ghats. So turn on touring mood with Thekkady and enjoy!! Wake up to a beautiful day with your sweetheart and breakfast drive to Kumarakom the most excellent place for the honeymooners. It offers nature's best with its virgin forest backwaters. It is a cluster of little islands on the Vembanad Lake, which weaves an enchanting web with its canals, streams and distributaries. On reaching Kumarakom check in the backwater resort and later on move out for the local tour. Visit the Kumarakom bird sanctuary, house boat jetty and others. Enjoy the 24 hours of backwater cruise from Kumarakom to honeymooner’s favorite destination Alleppey. In the morning after breakfast check into the super deluxe houseboat decorated to experience a magical backwater of Alleppey. The house boat is fully furnished with single and double bedrooms, sundeck, private balcony and a kitchen. This journey is considered to be one of the best attractions. 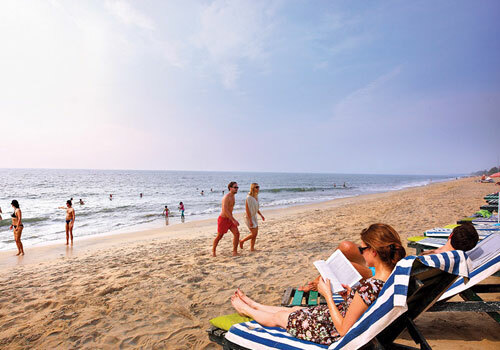 Feel secure because Kovalam, because of its natural location, is considered one of the safest beaches in the world. Enjoy overnight stay at your resort. After breakfast check out house boat and drive towards Cochin airport to board your flight to the onwards destination. It is time to say goodbye to a once-in-a-lifetime holiday.